On a initial viewing, The Bourne Ultimatum may seem like an incredibly fast paced and complex espionage drama. Well it is, and it isn’t. Let me explain. If you actually look at the plot and the incidents that happen over the film’s running time, you’ll find that the find is light on for story a features only a few action set pieces. The effect of rapid pace and plot complexity come from the techniques employed by director Paul Greengrass, cinematographer Oliver Wood, and editor Christopher Rouse. Visually the most notable technique utilised is the use of hand held camera, but even more powerful is the rapid fire editing. Now I’ll admit I did not sit through the entire movie simply counting the length of time between each cut, but for the few sequences which I looked at, I was astonished to find that there is a cut away at least every eight seconds. Most cuts are made every four or five seconds, but in this film it is not unusual for sequences to be built from wafer thin snippets of only one second in duration. The complexity of each sequence, from simple dialogue exchanges to frenetic chase scenes at train stations, is truly amazing. Greengrass and co, have certainly put in the man hours working out each sequence and how to cover the action from various vantage points, while at the same time keeping the plot – what little there is – moving forward – and retaining comprehension. It is the type of film-making exercise, which in lesser hands, could have turned the film into solely a showcase of style against substance. So from a technical standpoint, The Bourne Ultimatum is truly excellent, but the plot for this, the third entry in the series, is pretty limp. If there is a plus to the story, it is that it answers some of the questions that were raised in the first two films, but finding out how Jason Bourne became the man he is, is frankly, by this point in the series, almost redundant. The film begins almost exactly where The Bourne Supremacy ended. Jason Bourne (Matt Damon) is in Russia, with the police (and other agencies) hot on his trail. He is pretty badly beaten up after the events at the end of The Bourne Supremacy, but we know he is a survivor and will find a way out of his current predicament.The film skips ahead six weeks, and we are introduced to Simon Ross (Paddy Considine). Ross is an investigative journalist for the Guardian Newspaper. Currently he is in Turin, where he is meeting a contact in relation to a story he has been doing about a CIA operation called Treadstone. Off the record, the source says that Treadstone was only the tip of the iceberg. There was another, more covert arm to the operation called ‘Blackbriar’ which turned a select group of volunteers into highly trained killing machines. The first of these men was Jason Bourne. As Ross is a journalist, and although much of the information passed to him was off the record, he still publishes a lengthy article naming Jason Bourne. Meanwhile in France, Jason Bourne meets with the brother of Marie Kreutz (for those with poor memories, or simply haven’t seen the first two Bourne films, Marie was the character played by Franke Potente, that Bourne fell in love with, and then was subsequently killed by Treadstone). Bourne explains how Marie died, and also declares that he is going after the people who started it all. The newspaper article written by Simon Ross has not gone un-noticed, especially by Treadstone. The man assigned to get to the bottom of it is Noah Vosen (David Strathairn). He believes that Bourne must have leaked the information to Ross. Ross is put under surveillance, in the belief that sooner or later we will make contact with Jason Bourne. In a way, Vosen is right, but not because Bourne is the source, but he too is looking for answers. Bourne contacts Ross, and arranges to meet him at Waterloo Station. Bourne suspects that Ross will be watched by the CIA/NSA, so he takes every precaution. Bourne, discreetly brushes past Ross and drops a brand new mobile phone into his pocket. Then, once out of harms way, he calls him. Ross is initially confused, not realising that his own phone would be tapped, but Bourne puts him straight, and then guides him through a maze of CIA/NSA agents. Vosen also arranges for an assassin, or ‘asset’ as they like to call them in the movie, to be on hand for when Bourne meets Ross. Once Bourne takes out the bulk of Vosen’s agents, Vosen orders both Ross and Bourne to be killed. Unfortunately Ross isn’t a professional, and amid all drama unfolding around him, he begins to panic. Despite being told to ‘stay put’, Ross tries to make a run for it, but only attracts the attention of the ‘asset’, who shoots him dead. So Bourne is back to square one. But we know he won’t give up. Now he is going to find out who was Ross’ source, and from there trace the path back to Treadstone and find out the secrets of Blackbriar. For fans of Robert Ludlum’s books, the discoveries and the resolution that this film presents, may represent one of the biggest bastardisations of a literary creation ever! The character at the end of Doug Liman’s The Bourne Identity could, and still did live in Ludlum’s Bourne universe, but the seeds sewn in the second film and fully realised here, completely disavow Ludlum’s character. That’s not to say that what is presented on the cinema screens is crap. I am simply stating that the Bourne films and the Bourne novels are two very different beasts. Matt Damon has made Bourne his own, and as he ages, he actually seems better. In the first film, my initial reaction was that Damon was too young for the role. He won me over with the strength of his performance, but there was still that feeling that he was a boy doing a man’s work. But now, in his 40’s, Damon seems right for the role. Although I shouldn’t need to mention this, but Jason Bourne and James Bond are also two different beasts as well. Prior to the release of The Bourne Ultimatum there was a lot of negative press aimed at the Bond series, generated by the Bourne camp. Director Paul Greengrass was quoted on www.contactmusic.com saying, ‘audiences identify more with the spy-on-the-run than the shaken, not stirred Agent 007.’ I realise publicity is a big part of marketing movies these days, (and maybe the quotes are taken out of context) but I think that you should talk UP your own project and not belittle someone else. Once upon a time, the drunken conversation between men at the local pub was ‘who do you prefer Moore or Connery?’ It was a big question, and it elicited some powerful and emotional responses in its time. Now the question is ‘who do you prefer Bourne or Bond?’ Now I am quite happy to accept that some people like Matt Damon more than Daniel Craig (or Pierce Brosnan for that matter). An actor vs actor debate is quite acceptable in my book. It’s ‘old school’. But character vs character? I mean, really, Bond has deviated so much from what Ian Fleming put down on the page, and Jason Bourne too, is far removed from what Ludlum initially wrote. We are talking about two franchise characters, who change and evolve with the times. I know what you’re thinking, Bourne hasn’t changed! Well, I beg to differ – if you look at the Richard Chamberlain television movie from 1988, you’ll see that Jason Bourne Mk I was very different from Jason Bourne Mk II. But if we must enter into the Bourne vs Bond debate, here’s my two cents for what it is worth. I feel that Bond is the better character simply because he battles international villains – in a world were tourists are blown up on Kuta Beach, or jets are flown into sky-scrapers – it’s good to imagine or fantasize about a character who can deal with and stop those situations – a character who can deal with the problems that we have no control over. James Bond fulfills those fantasies. Whereas Bourne’s enemies are the people that created him. He lives in his own dirty little universe of corrupt C.I.A. and N.S.A. agents. 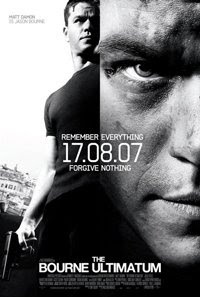 It was only during the first film, The Bourne Identity, when suffering amnesia, did Bourne enter our world, and through his relationship with Marie (Franka Potente), remain there. Once she was gone, Bourne reverted to living as a part of the espionage community, albeit as a loner. Not once, has Bourne saved the world. He is simply trying to escape from his own past – a past he in fact volunteered for. Overall, The Bourne Ultimatum is a very enjoyable film, but it is a step down from the previous two entries in the series. It seems that they have this great character, (and a great actor playing him) but are not really sure what to do with him. I guess the looming question is where do you take Jason Bourne next? There cannot be too many cynical / self serving CIA/NSA controllers left, who had a hand in Bourne’s programming. Who is he going to go after next? And what would be his motivation?